TV2 Norway editor Christine Espeland and Host Broadcast Services (HBS) chief technology officer Christian Gobbel are the latest speakers to be added to the line-up for Nordic Summit 2019 which is taking place on 7 March at Media City Bergen. This ‘primer’ seminar will provide an overview of the sports television market in the Nordics, discussing audience trends and the competition for rights and formats, and considering what might come next for sport in the region. Gobbel will discuss new workflows deployed for coverage of the FIS Nordic World Ski Championships which is taking place in Seefeld, Austria later this month. Based on his work with Infront, and the Austrian broadcaster ORF, Gobbel will outline the host broadcast set-up for the coverage and provide insight into the technical infrastructure that underpins the efficient production of this and other sporting events. Taking in many different sports, from alpine skiing and ice hockey to handball and biathlon, the Nordic Summit will place particular emphasis on providing real-world examples of how broadcasters and their technology partners are collaborating to improve efficiency, increase productivity and ensure that sports fans get the possible viewing experience. Other speakers confirmed include NRK Beta strategic advisor Eirik Solheim, TV2 Denmark graphics producer Adi Strichman, SVT technical producer Madelen Ottosson and Fox Sports NL head of production Henk van Meerkerk. As with all SVG Europe events, there will be ample networking opportunities throughout the day including one the night before the Summit, on the evening of Wednesday 6 March. 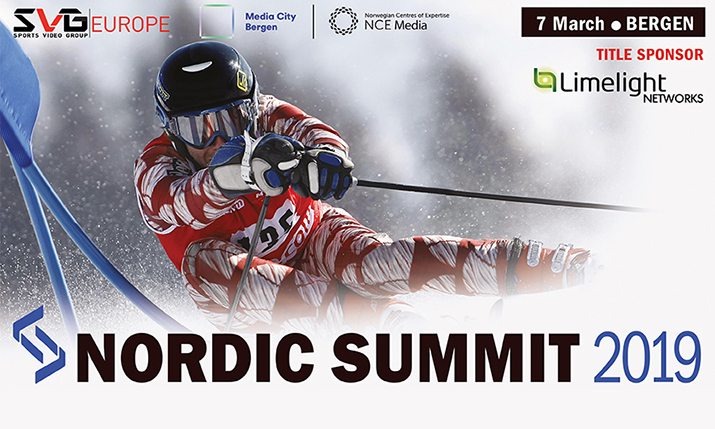 The Nordic Summit, produced in association with NCE Media and Media City Bergen and sponsored by Limelight Networks, will take place on 7 March 2019.